Home or business is conveniently treated on a monthly basis. We use the best chemicals on the market that are available to us. The chemicals we apply are low odor and highly effective chemicals with great residual activity. We spray the baseboards (crack and crevice treatment) to create a treatment for insects inside, and do an exterior base treatment, except when moisture is present. Chemical will kill on contact and provide a residual control of insects. If any infestation of insects is active during the service, we target these areas to provide better control. This program provides general pest control of roaches, spiders, fleas, ticks, silverfish, earwigs, scorpions, mice, rates, crickets, ants, and many other pests. 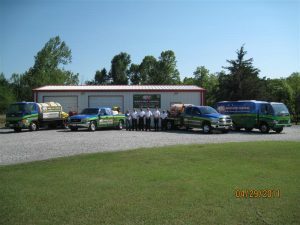 **(Does not prevent or control termites or any other wood destroying organisms)All roach infestations require a minimum of four (4) monthly treatments. Usually after first initial treatment of roaches, customer will see more roach activity than ever because of applied chemicals.Ant control will require additional exterior power spray treatments. We will call you the day before to set a time to perform your service. We ask that you work with us to keep your contract current by making the appointments happen. A proven means of entry into the property to be treated must be established. If you cannot meet us to let us gain access to perform your service, a key may be hidden or issued to us so we can complete your services. Because customers get free service calls with this program, if customers feel they are experiencing too many live insects, simply call us and we will re-spray for free. **Some restrictions apply on roach and ant infestations. Services will automatically be scheduled and completed when due, only one re-schedule will be allowed per scheduled service. If we are locked out on a second attempt, or not allowed to complete the service, then we will complete an exterior treatment and customer will be responsible for the amount of the scheduled treatment. If customer cancels after we arrive at property and refuses to let us service the property, there will be a $25.00 service charge. Same as monthly except treatments are every two months, and you are entitled to four (4) free service calls per year. Our most popular program. Same as monthly except treatments are every three (3) months, and you are entitled to 2 free service calls per year.